In 1902 Manchester United neared bankruptcy, with debts of over £2,500. At one point, their Bank Street ground was even closed by the bailiffs. Just before having to be shut down for good, the club received a sizeable investment from J. H. Davies, the managing director of Manchester Breweries. Legend goes that Harry Stafford, the club captain, was showing off his prized St. Bernard dog at a club fund-raiser, when Davies approached him to buy the dog. Stafford declined, but was able to persuade Davies to invest in the club and become club chairman. It was decided at one of the early board meetings that the club required a change of name to reflect the fresh start they had been afforded. Manchester Central and Manchester Celtic were among the names suggested, before Louis Rocca, a young immigrant from Italy, said "Gentlemen, why don't we call ourselves Manchester United?" The name stuck, and Manchester United officially came into existence on 26 April 1902. 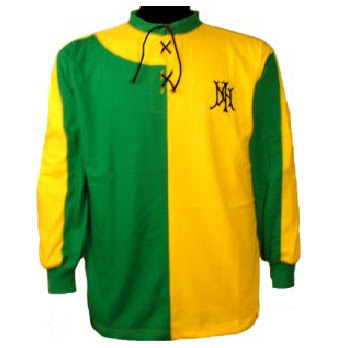 Davies also decided it would be appropriate to change the club's colours, abandoning the green and gold halves of Newton Heath, and picking red and white to be the colours of Manchester United.